Picking up where I left off, my Python screen scraper was working, iCal events were getting published for general consumption and I was on my way to BarCampAustin. Pleased with my script, I figured everyone would be using it and my session would be well-received. Once I got to there, I noticed the crowd mulling about The Big Board, adding their entries and shuffling around sessions. Much to my chagrin, I realized no one had bothered syncing up the board with the wiki entries, so the 10 or so entries there weren’t represented. I asked a volunteer who was syncing them up and he said nobody was. So unless I felt like syncing the Big Board back and forth between BarCamp and the wiki, my script was screwed. Changes were happening all the time, between sessions, all day long and there were way too many for me to track so I gave up. I figured it would be a good reminder about the fragility of screenscrapers for my presentation. Yes, I had the misfortune of scheduling head-to-head with the most popular session of the day. My session started poorly, technical difficulties in the fact that I didn’t have a VGA adapter for the projector (I had the fore site to bring my DVI adapter though). Luckily for me, Cote’ loaned me his laptop and we transferred the source over and got started. Attendance was sparse, besides Cote’ and I there were 5 people, but at least they were all Python hackers and participated in the review. I walked through my code, asking questions about proper Python technique and explaining decisions and code throughout. I picked up a couple of good pointers and at one guy said I showed him a better iCal library. A minor success, but I enjoyed it nonetheless. I recently attended the third Austin BarCamp and gave a brief presentation on “Hacking iCal and Python”. Since I was in the process of learning Python, and there seemed to be a dearth of technical subjects (lots of social media type stuff), I figured I’d look for a presentation subject. Thursday night before BarCamp (Saturday) I started brainstorming. 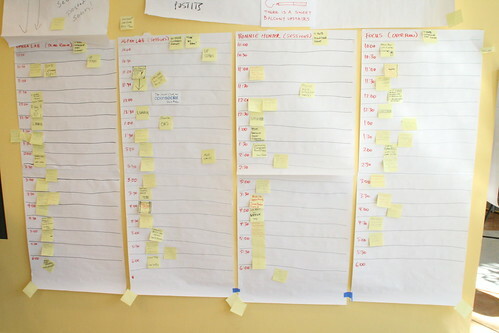 There it was, the BarCamp Schedule, a wiki of presentations and times, updated regularly with planned presentations. I figured I could write a script to parse it, convert it to iCal format and publish it and everyone would have access to an up-to-date schedule and sync it to their iCal/iPhone/Google calendar. Plus I’d get a presentation that I’d like to see myself. My name is Matt (AKA mray) and this is my little corner of the Internet where I’ll be writing my hopefully pithy observations on the sausage-making that is software, as well as whatever else strikes my fancy. The title for this blog is essentially the easy way to do things. When you look at your options and you see one straightforward way, and the difficult alternatives. When the easy way shines brightly, most people will follow that. Hopefully this is also the right way to do things.